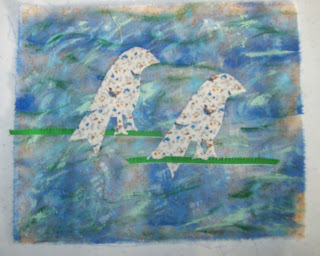 Here's the second painted applique piece I put together the other day for practice. It's smaller, about 10 x 8.5" Again, same thing ... lightly painted fabric and some applique inspiration from Summer Garden Quilt pattern, which I've now drained of inspiration and placed in my shop. 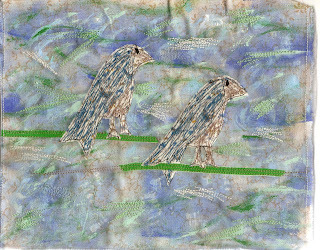 I stitched in the birds, the rails and some free form color here and there amongst the paint. I was surprised how dramatically different they look .... the difference being the camera (first pic), and the scanner (second pic). The scanner dramatically washes out the color. As I was working on the birds, the term thread painting popped into my head and I took a quick break to Google it for tutorials. I, just as quickly changed my mind. I definitely don't have the right equipment and setup for that, at this time. 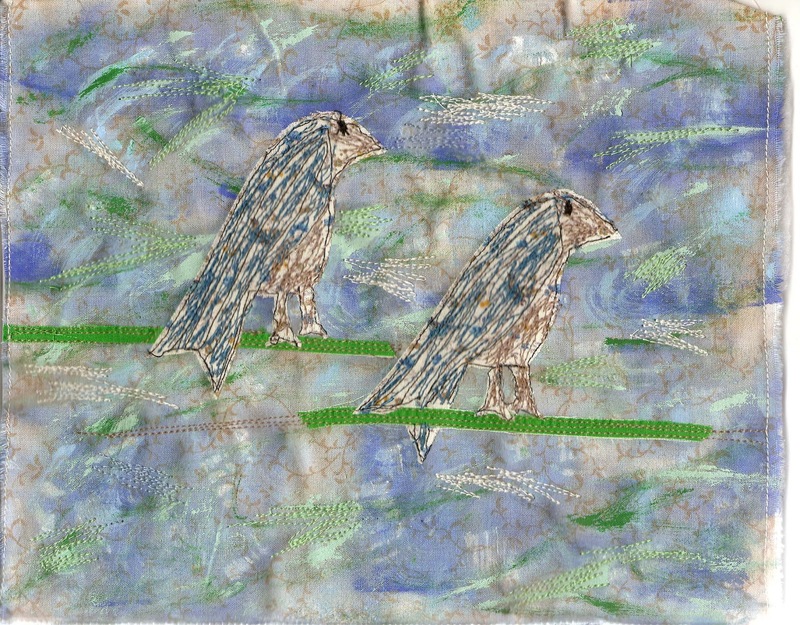 But will put it on my consideration list for that new sewing machine sometime in the future. For now I'm content on playing and experimenting with the fabric. I'm looking for my style. I've also set this one aside, and will come back to it later when I'm ready to experiment with finishing techniques. Other than that, it is not a keeper. As I worked, I found myself thinking about how, in my mosaic days, my centerpieces were typically in threes. I always equated that to be three of us. I noticed, that I now seem to be doing things in Two's. How interesting that this evolves ... empty nestors and the subconscious mind.